I didn't blog much last week owing to the visit of our great friends Matt & Amber Nielsen. We had a great time with them. Justin & I are not at all glad to see Matt. They have a cute little boy named Carter, seen here getting cozy with Millie. Watch those hands boy! We spent some time at the Springs. Joseph was having the time of his life. We also took a little "mancation" to Universal Studios. It was hot, but we had a good time, and although you can just barely see it in this photo, Justin managed to get some gum to travel from his tongue to the top of this dead-drop ride at Islands of Adventure. Justin, Matt, and Jon made another go at the "Gallon Challenge." Perhaps there will be video to come. We were sad to see them go but grateful for the time we had together. Almost felt like old times at BYU, except for the whole thing about being married and the kids, but that's a small thing, right? 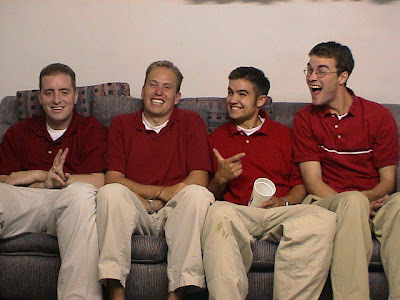 (Fall 2001 with Tom Proctor). Great pictures Joe. Sounds like an exhaustingly fun week. I wish you could pop out the picture of the gum on his head. Why won't they let you sometimes? I laughed pretty good when I read that though. oh my gosh, blast from the past! haha fun to see pics of everyone. Oh my goodness... Matt who could lactate out of his eye! Fantastic! Yes, who could ever forget Lactating Matt? Let's hope he performs that trick at ward talent shows. Looks like a fun mini reunion. so so awesome. i swear you all look the same. Thanks for sharing these Joe. We had such an awesome time with you guys. Maybe you should put up a couple pictures with vomit in them - that's always for for everyone to see.